This easy 2-block rag quilt pattern is perfect for floral fabrics or any other quilting fabric you wish to use. Try a focal fabric in the large squares, fussy cutting if you want all squares to look the same. I chose a combination of flannel fabrics for my quilt, using a large-scale floral for the plain squares, a medium floral for the larger rectangles, and a small scale print for the bars on each side of the rectangles. The border is pieced from scraps. I've included yardages and cutting instructions for two rag quilt sizes, a quilt that finishes at about 50-1/2" x 68-1/2" and a larger version that measures 68-1/2" x 86-1/2". If you're new to rag quilting, read Rag Quilt Basics before you begin. New quilters should review How to Cut Long Strips of Fabric and How to Cut Patchwork Shapes. Yardages are for the quilt top only. You'll need the same yardage and patchwork pieces for flannel batting and for the quilt backing. Yardages include enough excess to cut pieces for the scrap border. Cut four 10" wide strips of fabric from selvage to selvage; cut sixteen 10" squares from the strips and one more 10" square from remaining fabric. Cut five 5-1/2" wide strips from selvage to selvage; cut eighteen 5-1/2" x 10 rectangles from the strips. Cut three 10" wide strips from selvage to selvage; cut thirty-six 3-1/4" x 10" bars from the strips. If your fabric isn't quite 44" wide, you might need to cut three more bars from extra yardage. Cut an assortment of fifty 3-1/4" x 5-1/2" bars from leftover yardage. Match numbers and sizes of each piece cut above. Gather the medium-scale and small-scale rectangles and bars. Keep the fabrics in separate groups: quilt front, batting, and backing. Place a 5-1/2" x 10" backing right side down on the table. Center a batting piece of the same size on top of it, and then finish with a quilt top piece positioned right side up. Secure with straight pins. Repeat with all 5-1/2" x 10" pieces. Place a 3-1/4" x 10" backing bar right side down on the table. Center a batting piece of the same size on top of it, and then finish with a quilt top piece placed right side up. Secure with straight pins. Repeat with all 3-1/4" x 10" bar pieces. Use a 1/2" seam allowance to sew the long side of a narrower bar stack to the long side of a wider rectangle stack, placing wrong (backing) sides together. If fabrics are directional, take care to align them as planned. Use chain piecing to speed up assembly by sewing a second bar stack to another rectangle stack without taking the first unit out of the machine. Keep sewing until each rectangle stack has a bar stack attached to one side. Remember to align backing sides together for sewing. Clip threads between units and chain piece a bar stack to the opposite side of each rectangle stack. Arrange your pieced blocks and 10" floral squares into seven rows, each row with five blocks. Alternate block placement in adjacent rows as shown. Sew the blocks in each row together, again placing backing sides together. Sew rows together. Secure with straight pins to keep fabrics from shifting. Make 3-layer sandwiches for border pieces using the same method. Sew ten border pieces together along the quilt's shortest sides, backing sides together for sewing. Repeat on the opposite. 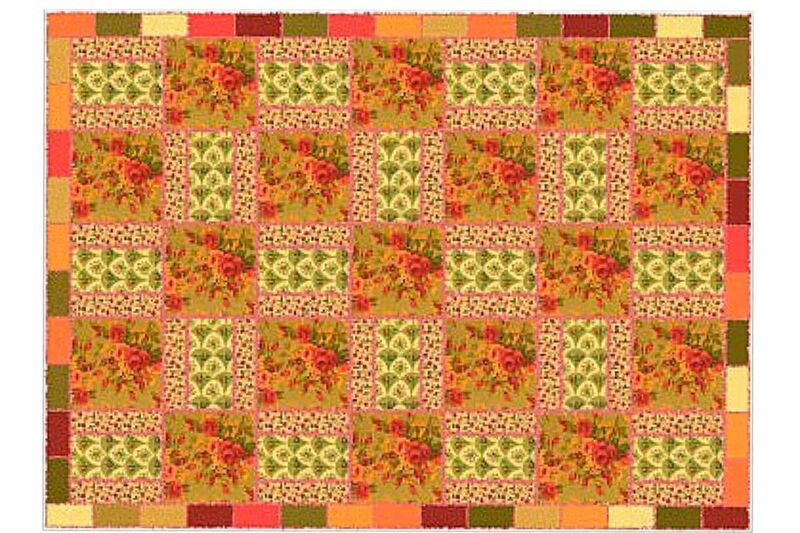 Make and sew a 15-rectangle border to sides of the quilt. Use my general rag quilt instructions to finish the quilt. The larger version of this rag quilt has nine rows, each with seven blocks as shown above. Otherwise, the quilt assembly is the same. Yardages are for the quilt top only. You'll need the same yardage and patchwork pieces for flannel batting and for the quilt backing. Yardages include enough excess to cut pieces for scrap border. Cut an assortment of sixty-six 3-1/4" x 5-1/2" bars from leftover yardage. Sew the side borders on first, after assembling two borders with eighteen bar stacks each. Make two more borders, each with fifteen bar stacks. Sew a border to remaining sides of the quilt.